We got a break in the cold weather this weekend, so it was imperative to spend some time outdoors, as it could be our last chance for warmth for awhile. Yesterday I gladly joined my friends Linda and Eddie and Linda’s brother Dave, on an excursion to see the Sandhill Cranes at Jasper-Pulaski Fish and Wildlife Area near Medaryville, Indiana. I have been to this location perhaps three or four times before, to watch the cranes come in at night to this staging area as they prepare to migrate farther south. It’s an hour later in Indiana so we left around noon to get there around 3:00, which is about when the cranes were just starting to come in. Along with the cranes came clouds which made it harder to see any color on them. But the spectacle soon negated any complaints. 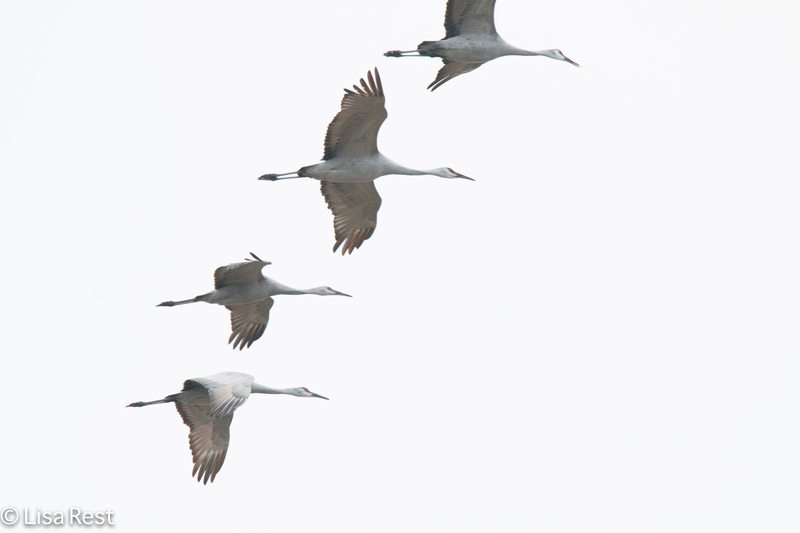 Within twenty minutes or so, groups of cranes began to arrive from everywhere. There seemed to be more coming from the southeast than from where we stood on the northwest corner of the observation platform. 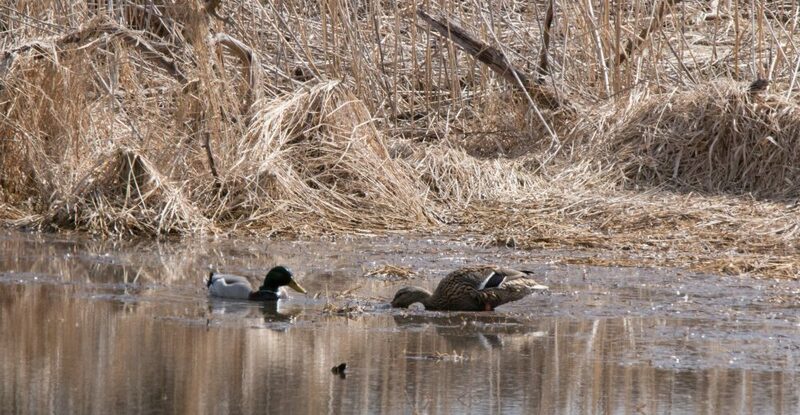 The near field looked as if it had been tilled and puddles had formed where ice had melted. In previous years, they have gathered in the nearer field which is right below the platform. 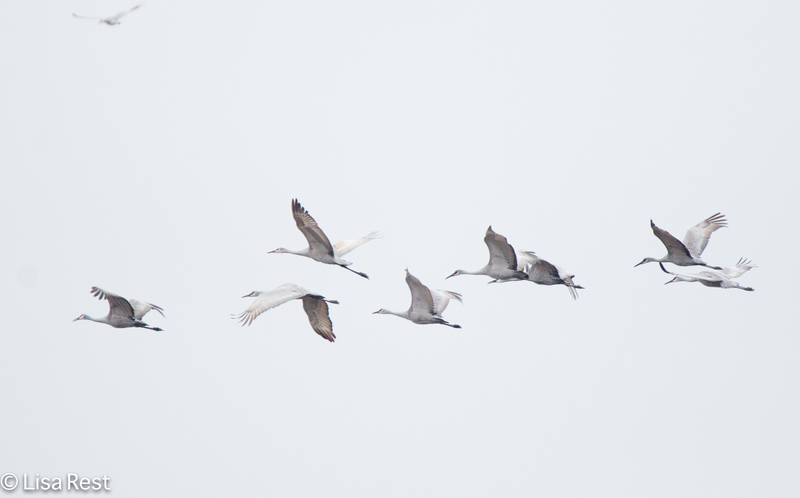 Unfortunately this year the cranes were in a distant field to the southwest, which explains the gray mass in the pictures above and below. It was cloudy and windy but I managed to get some pictures anyway, and a little Sandhill Crane soundtrack to go with them. 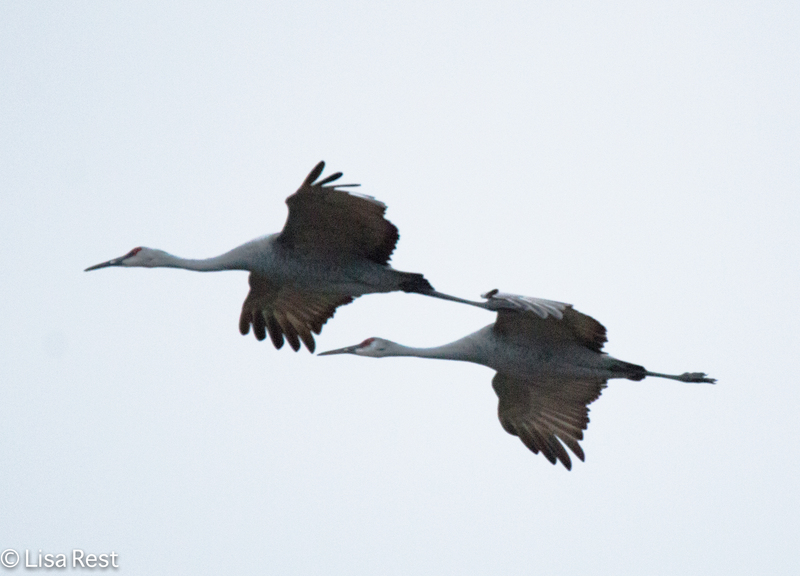 Earlier last week, over 20,000 cranes had been counted. That was right about the time people were reporting seeing them flying in vast numbers over the Chicago area. 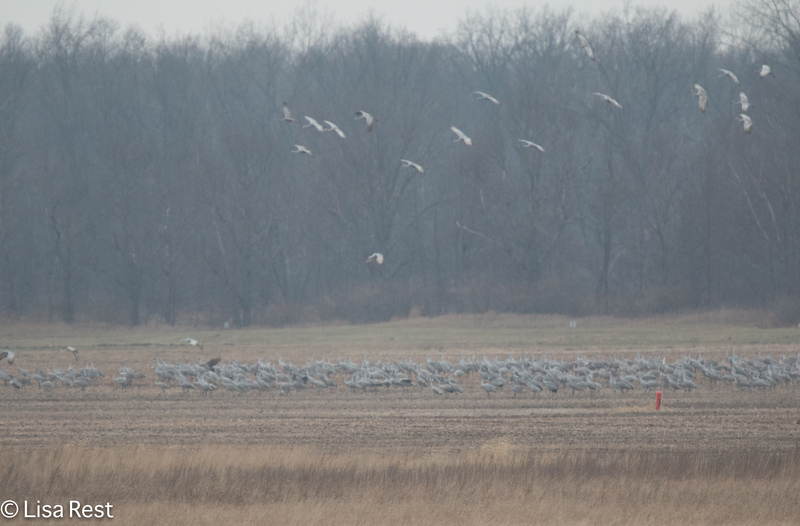 A few days before we went to see them the number was just over 12,000, with a Whooping Crane sighted among them. I kept scanning for a Whooper but did not find one. 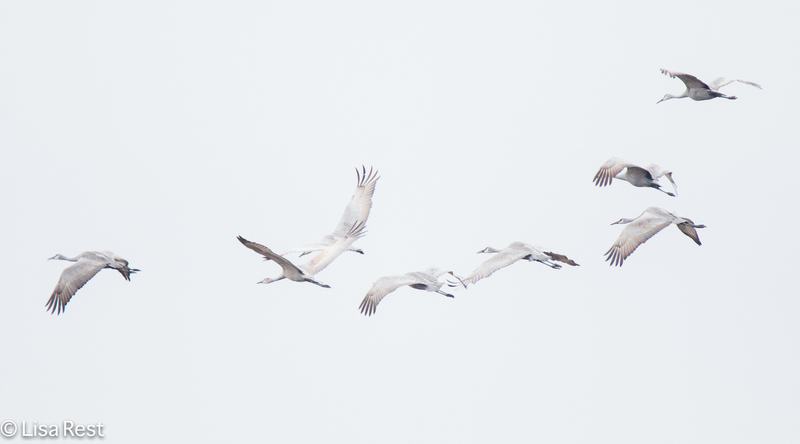 I think the first or second time I went to Jasper-Pulaski years ago, there was a Whooping Crane, which was easy to spot, being at least twice as large as the Sandhills and all white. When they come in from different directions and jockey for a place to land it looks chaotic to us on the ground but the cranes somehow have this all choreographed to perfection. 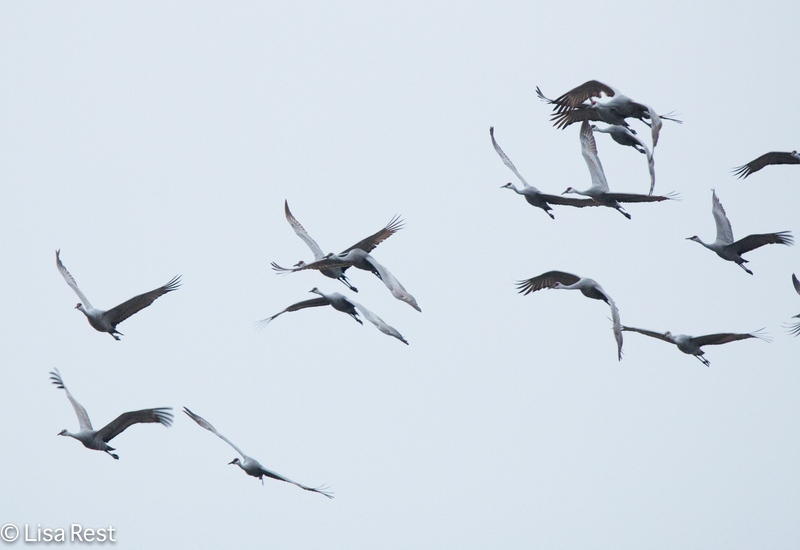 This entry was posted in birds, photography and tagged Indiana Department of Natural Resources, Jasper-Pulaski, migration, Sandhill Cranes, staging area, Whooping Crane by Lisa Rest. Bookmark the permalink. Thanks, HJ! I was surprised I got any shots at all because of the cloud cover and the birds generally being pretty far away, but I guess I’m getting used to the lens. 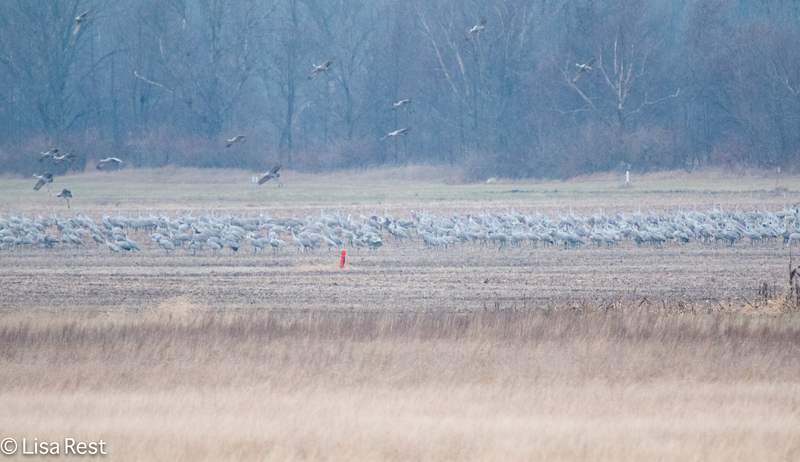 It’s always a thrill to see the cranes in great numbers and to hear them. I forgot to mention they were too far away to see any courtship dancing too… Maybe next year! Lisa, thanks for inspiring us to get going and get out to see this fantastic phenomenon. I know my brother who is quite an outdoorsman enjoyed this. He said you are the Most Serious Birder he has ever known. I said other good and great things about you. Actually my friend Lesa posted a YouTube video yesterday on facebook about banding Whoopers to see where they go and what habitats they prefer, to track them and help them out, and it made me cry, they’re so beautiful and their recovery is so fragile. What a majestic bird, thanks for the link. I’ve seen Sandhills yet can’t imagine a pure white version twice as tall. Plus their sound it truly unique! Hmm, I just listened to your recording and maybe the whooping and Sandhills calls are quite similar!